The movie Love Story, released in 1970, was the ultimate romantic weepie for an entire generation. 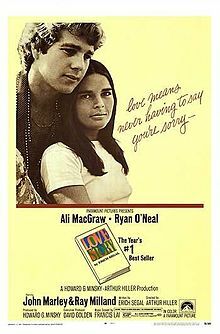 Love Story was about the young Harvard student from a very good (and wealthy) family (Ryan O’Neal) falling in love with a Radcliffe student from a working class family (Ali MacGraw). When Ryan O’Neal marries Ali MacGraw, his father cuts off all financial support and they live the blissful life of a poor young married couple living above the laundromat. (Spoiler alert) Ali MacGraw becomes terminally ill; the movie ends with the deathbed scene of Ali MacGraw and Ryan O’Neal telling his father that “Love means never having to say you’re sorry.” I guess you had to be there. “(Where Do I Begin) Love Story” was recorded on December 3, 1970 and released that year on the album Love Story. It was arranged by Peter Matz. “(Where Do I Begin) Love Story” was recorded on January 31, 1971 and released that year on the album Get Happy with The London Philharmonic Orchestra. It was arranged by Marty Manning.